3) Doing a duo would mean I wouldn't wipe myself completely and be too tired for the Mountains to Sea 12 miler trail run the next day! It did make for a long, tough weekend though, starting with the decision of driving there the morning of the race- getting up at 5 am and getting my stuff in the car and out of the house by 5:45 and settling in for a 2 hr 40 minute drive (plus two bathroom breaks). I made it to Warrior Creek without any directional challenges and parked next to Tammy and Steve by 8:30 am, still 1 hour before the pre-race meeting. Everything was in order, I had my heart rate monitor on and was indecisive about how many layers I was going to wear. It was a little on the chilly side but it seemed to be warming up quick. The pre-race meeting consisted of someone on a speaker telling us how the first lap would go and when the time constraint on the last lap of the day (must be started by 3:40 pm and finished by 5 pm to count). The race started at 10 am as one big start and I settled in the way back for the first lap. This first lap consisted of 1.5 miles on the pavement to spread people out but unfortunately that didn't really happen because once we got on the trail, it was like I-40 at rush hour with everyone going at 0.1 mph trying to get into the singletrack. I found it funny, one guy said "this is the best group ride ever! ", people laughed and then it started moving again. We did a small section of singletrack and I was burning up in my light jacket so I took it off and stuffed it in my Hydrapak. We came out on a road crossing and Tammy was there so I stopped and handed her my jacket because I was worried that the extra 0.5 lbs would slow me down and I still had 12.5 miles to go! I got going again but was way, way, way in the back. The trail pretty much was my own for the most part until mile 6 when some juniors passed me and a couple of guys and one other woman. This time, I really admired the juniors (all boys) who were racing, they all had impeccable trail manners. They asked if the could pass me, they said "good job!" and did a great job of letting me know they were there! It was awesome to see such young kids giving encouragement. I digress though, the trails at Warrior creek are extremely well groomed and not technical at all until after mile 6 where there is a very short section of rock steps, that I successfully navigated but then I didn't have the energy to pump up to the top of the bridge so I had to walk up on the bridge and saw that it sloped down again so I got back on my bike and rolled down. Here, I passed two guys and heard that one of them had fallen off the rock steps and down the sloping hill. He was okay but his rear brake didn't work anymore. I think post mile 6, I hit a berm and didn't look ahead out of the turn and basically crashed my bike into the berm and fell on my left side and simultaneously banged my right leg against my flat pedal. That was my only crash of the day and was not too bad. After that, the only "technical" stuff came between miles 8-10 where you had to navigate 3 rock gardens and a skinny bridge. All of this was fun to me but short-lived. Then it was more climbing and then more freaking climbing for the last 2 miles. I had this impression that Warrior Creek was all flowy and it is in many sections but there are some decent climbs out there and I was not ready for so much climbing . That first lap took me 2 hours and when I saw Tammy I told her that I wasn't sure if I wanted to do another lap because I felt wiped out. It was a different kind of riding and not something I was used to. However as she went out for her lap, I went back to my car, ate some food (Veggie sticks, a chocolate whey protein shake, an orange and some Cliff Shot bloks), and I started to feel better. 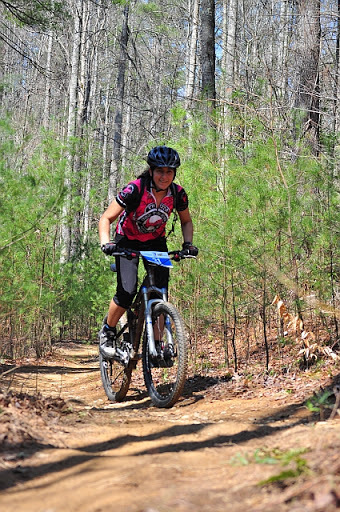 Tammy also had a tough time out there (she also had never been on the trail and got vertigo from riding the ridgelines) and when she rolled back in, I was ready for my second lap hoping I wouldn't hate the climbing as much this time around. The second lap did feel better than the first because I knew what was coming, I still got nervous on the really bermy sections and there were 3 times when a faster rider was right behind me on sections that were like 4 berms in a row (double S turns?) and I felt bad that they could not pass but also I didn't want to stop in the middle of a berm. I did for one guy and that sucked because I went up the berm and got myself stuck by not turning and there is something to be said about letting momentum carrying you. 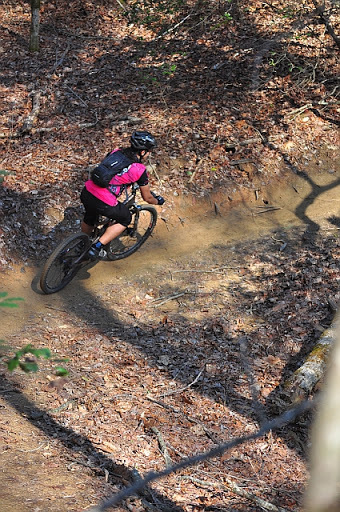 The best part of the second lap was the photographer in the rock garden section; he got pictures of me clearing the rock section (pictures have not been posted up yet), I can't wait to see them because it is evidence that I did this section on my bike and did not dab once! I got back to the start/finish line by 4 pm so we missed the cutoff to do a fourth lap but that was okay with me. This was a totally different beast than the 6 hour endurance race at Harris Lake and I don't think I really thought of a strategy or a way to do this race. 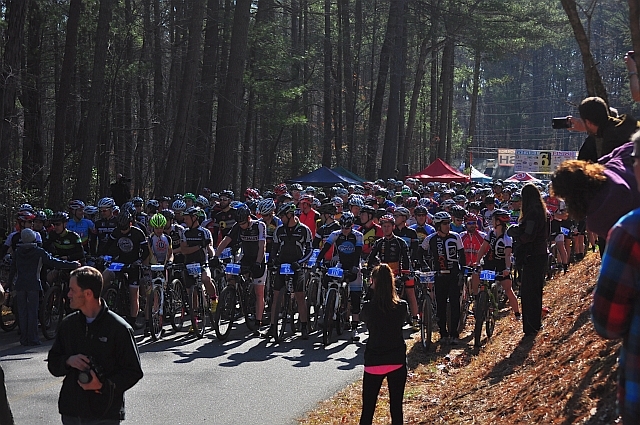 One thing I should have done is pre-ride the course and practiced more climbing at Umstead to get ready for this type of race because it was more cardio and much less about technical abilities. I am very glad I did it as a duo with Tammy though. It really helped to have a partner and not have to deal with the mental angst of just racing against yourself and I needed to have the break that being a duo offers. So race results- in the end we came up 14 out of 15 female duos. There was a strong field and I know a number of the women racing have coaches, raced here before and were just stronger riders (damn all that cardio) but it was still a lot of fun. I'm sure if I had a coach, there would be 8 other things to improve on. One good thing though- my hips didn't hurt during the race and I didn't any electrolyte issues. I did still get hungry and had to have one snack (Honey Stinger Gel) during each lap. 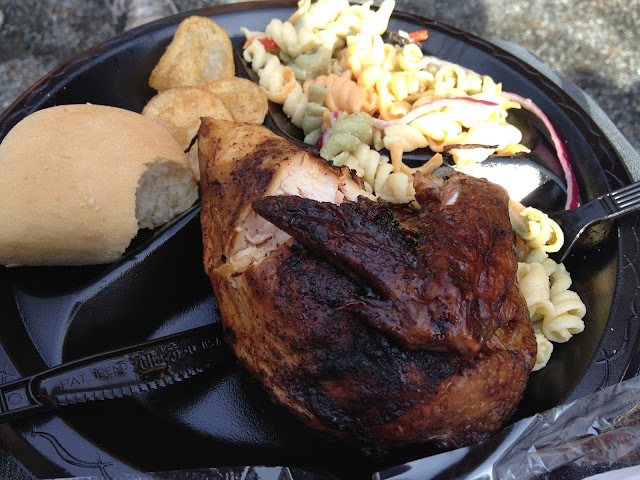 After the race was over, they served us a nice bbq meal (picture below) and then we packed out to head home. I got home around 8:45 and was ready for bed since I was going to have to get up again the next morning at 5:30 for my 8 am 12 mile trail run (post to come)! I'm somewhere all the way in the back!